Yelloweye mullet are greenish-brown along the back with brown fins, silver or yellow on the belly, and a distinctly yellow eye. They grow to around 40cm and 1kg. The less common sea mullet grows to over 50cm in length and 5kg in weight. Mullet are commonly caught in nets, specifically mullet nets, but they may provide good rod and line sport when caught on light fishing gear with small hooks fished under a float. Mullet can usually be found around beaches, estuaries, jetties and from rocks adjacent to sandy areas. The flesh of this species has one of the highest sources of the "good oil" omega three fatty acids. 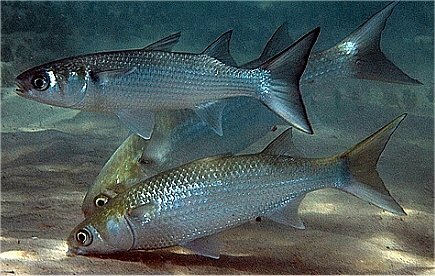 Mullet tend to school as juveniles and during spawning season as adults. They spawn at sea. Mullet feed on detritus, diatoms, algae and microscopic invertebrates which they filter from mud and sand through their mouth and gills. A proportion of the sand ingested helps the grinding of the food in the muscular stomach. There are two types of commercial fishery for mullet. One is an ocean beach fishery targeting spawning adults a their roe is highly prized . it is in high demand within Australia and overseas. It can be sold fresh, or smoked or dried. Beach seine nets are used for this type of fishery. The second method of commercial fishery is the estuarine fishery. This accounts for the majority of the mullet catch. Mullet are captured all year round but the majority of the catch occurs in late summer and autumn. Coastal set gillnets and tunnel nets are the main form of gear used for this fishery. Minimum size limits apply to commercial catches of mullet in QLD, NSW, VIC, TAS and SA. In the early part of the twentieth century, the fishing industry in Australia began to target additional species and use of new fishing methods. Until mid-century, sea mullet was the most common commercial fishery, followed by barracouta. A very common species in our waters, it is often found near sandy areas where they feed on small animals such as sandworms and small cockles. Sometimes large schools can be seen mouthing and tailing at the surface. This feeding behaviour occurs where there is an abundance of plankton in the water. Mullet are not a common catch for recreational fisherman, although in brackish to freshwater mullet will accept baits of dough or earthworms, on small hooks under a float. Small "poddy" mullet are a good live bait for such fish as flathead and can be caught in a narrow bottle or similar container filled with bread. Many mullet species are difficult to catch, but both the sand and yellow-eye can be taken on light tackle and small hooks baited with bread, dough, peeled prawn, cockle or pipi, worm pieces or maggots. Yellow-eye mullet are the more willing biters, and will even take flesh baits, squid strips and pieces of pilchard or whitebait. Most of the successful rigs for these species incorporate a light float, such as a quill or small bobby cork, although the fish can be taken on un-weighted or very lightly weighted lines. They respond extremely well to a berley trail of soaked bread. Sea mullet are generally harder to catch, but will bite at times. Use line between 2 to 4kg. Mullet can be a problem if lighter line is used, due to the line being prone to tangles while casting, as well as while the Mullet are on the bite. Lighter lines can encourage more strikes. A rod around 1.8m is ideal for both jetty, rock and boat fishing. No.8 - 10 Beak-Nickel "Holdfast" nylon snelled hooks that come pre packed are ideal. Mullet have small mouths ! Minced steak (or kangaroo or horse meat) with added semolina and curry or garlic, Tubeworms, Tuna Flesh, Bungum Worms, Seaweed Worms. A stiff mixture of soaked pellet berley squeezed into a berley spring will disperse slowly and attract mullet to your bait. Some anglers stake hessian bags containing various berley mixes at the waters edge, small particles forming a steady berley trail for mullet schools to follow and remain in. 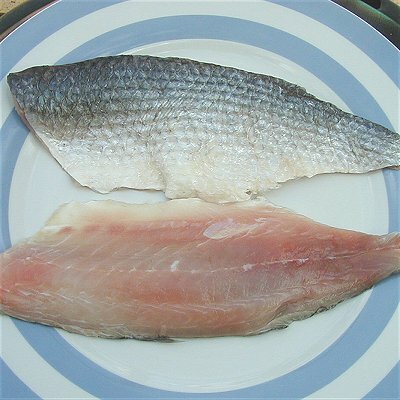 Mullet rate as fair to good table fish, their oily, somewhat fatty flesh being well suited to smoking, while sand mullet are arguably the tastiest of the mullet clan. All mullet should be cleaned promptly if intended for the table. Sea mullet (Mugil cephalus) is an important species for commercial fishers in southern Queensland. The species is a major component of the ocean beach fishery, but is caught in similar numbers in bays, estuaries and near-shore coastal waters primarily south of Bundaberg. Mullet are caught using a variety of nets and netting methods. The nets and methods used depend on the fishery. Some of the nets used include mesh nets and seine nets. The estuarine fishery uses gill and tunnel nets to target fish for the local fresh fish market throughout the year. 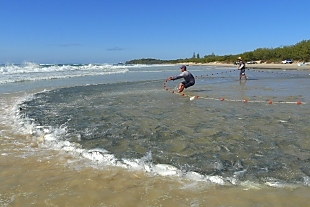 The ocean beach fishery uses seine and haul nets to target pre-spawning fish from April to August to supply an international export market for mullet roe.